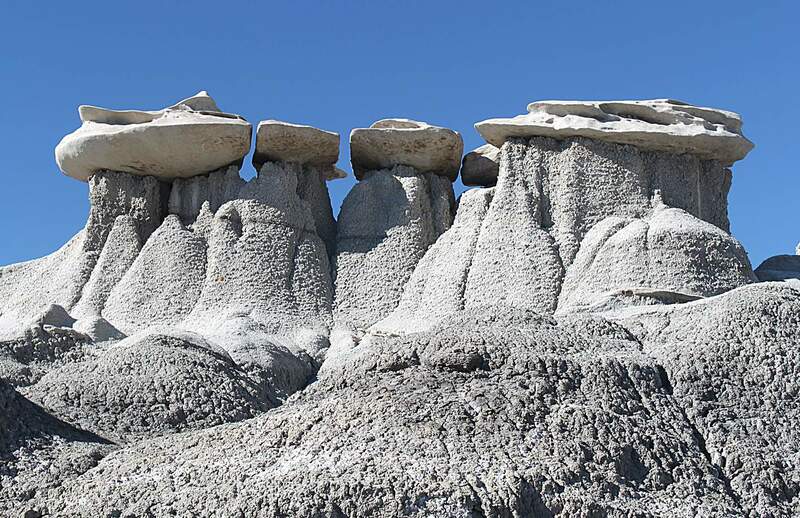 Visitors to the Bisti/De-Na-Zin Wilderness, 40 miles south of Farmington, can spend a day walking through an otherworldly landscape.Some rock outcroppings make perfect tables and chairs for lunch, while others seem to create miniature worlds at a hiker’s feet. 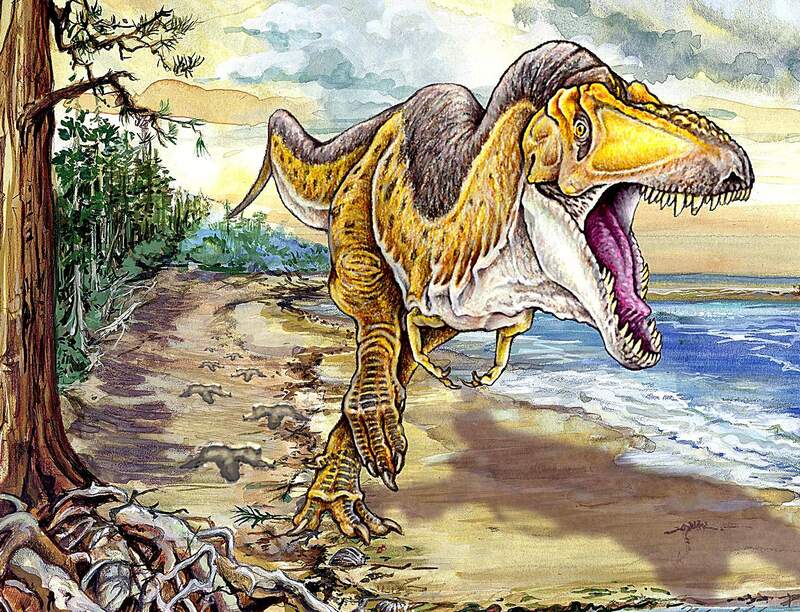 This artist’s drawing shows the Bisti T-rex, slightly smaller than his larger more famous carnivorous cousin, charging across the landscape, where hikers now traverse. More than 70 million years ago the Bisti Badlands was the Bisti beach. Volunteer Paul Sealey with the New Mexico Museum of Natural History and Science discovered a new type of Tyrannosaurus rex in the Bisti wilderness. 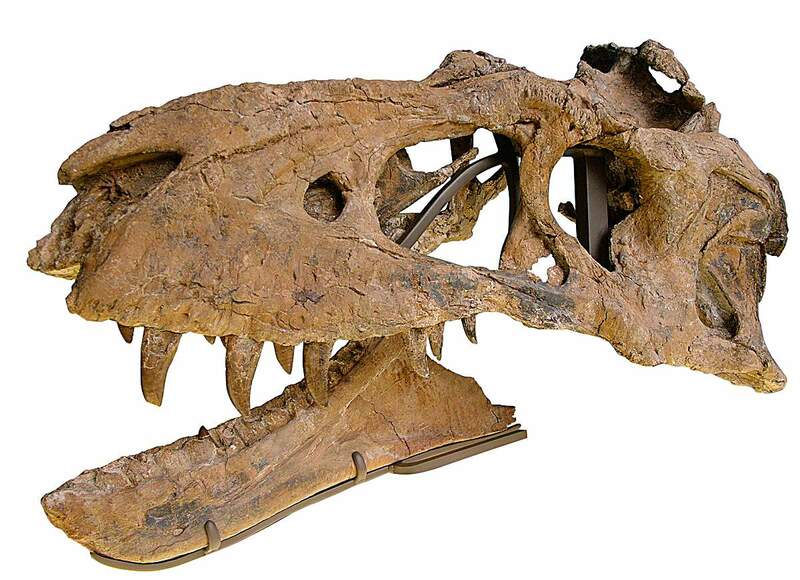 This is a holotype of the skull and jaw the dinosaur. Andrew Gulliford studies the eroded rock outcroppings of the Bisti Badlands. 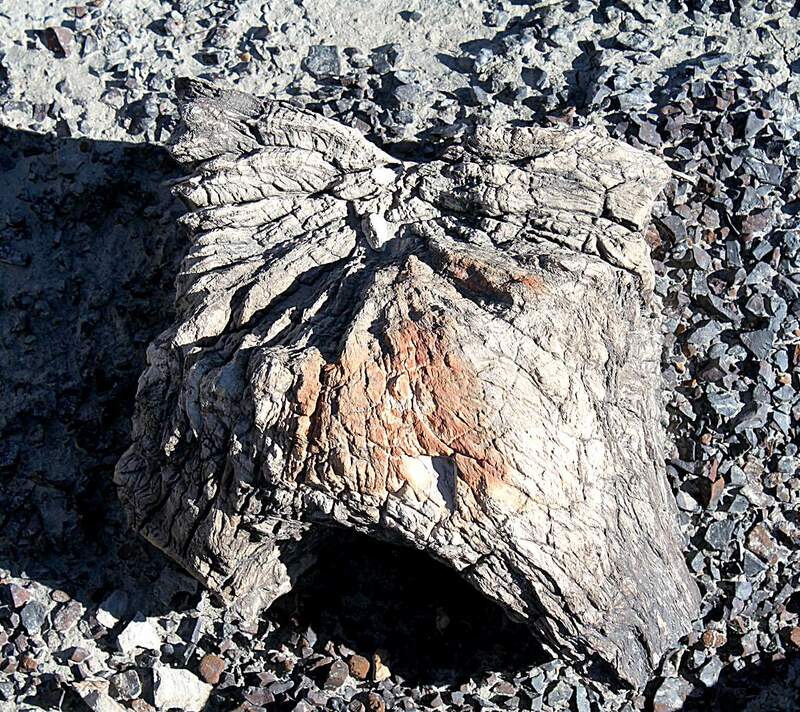 Petrified stumps exist in between rounded gray deposits that resemble sleeping elephants. Among the bizarre rock outcroppings to be found in the Bisti Badlands are capped rocks of all shapes and sizes, which appear even stranger as the hiker gets closer. Hoodoos and rock people appear on the horizon once hikers have walked an hour beyond the Bureau of Land Management parking area. Overcast days can make Bisti hikes even more surreal, but also complicate finding the way out. 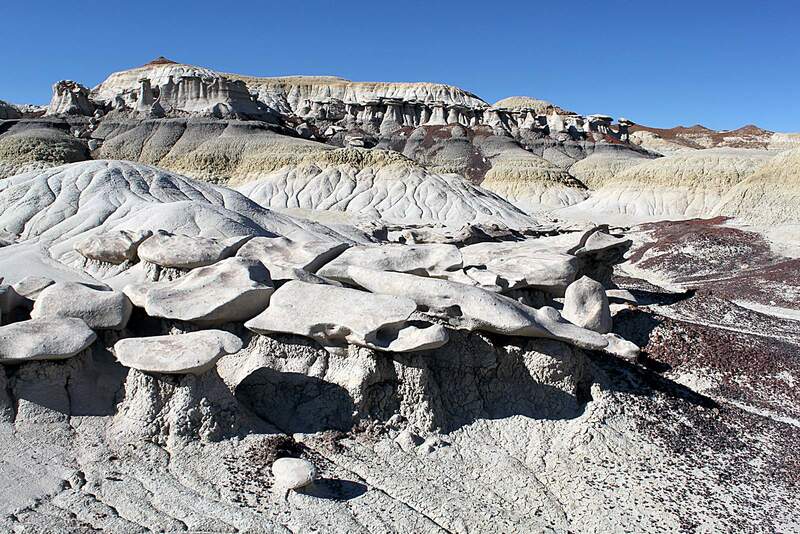 In places, the Bisti resembles a sci-fi movie set without the aliens. 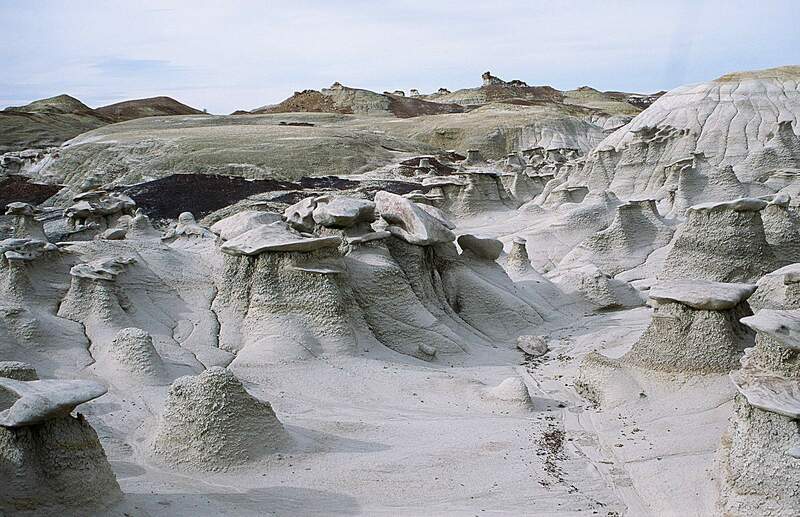 Stretching from U.S. Highway 371 east to U.S. Highway 550, the Bisti/De-Na-Zin Wilderness, 40 miles south of Farmington, offers miles of quiet hiking for trekkers willing to be self-sufficient and to carry adequate water as none can be found. Who knew you could leave Durango and drive to the planet Mars? Visiting the Bisti wilderness south of Farmington certainly has the feel of another planet. Maybe that’s why 60 percent of the annual visitors to this more than 40,000-acre Bureau of Land Management wilderness are international tourists. Not only are people unfamiliar with the wilderness, they also do not know that the Bisti Badlands has its own Bisti Beast. Parking at the BLM trailhead off of New Mexico Highway 371 just 40 miles from Farmington, visitors are greeted by a wooden BLM kiosk with absolutely nothing on it. No maps and no warnings about dehydration, getting lost, sinking into soft soils or the perils of navigating in and out of the wilderness if the sky becomes overcast and directions difficult to determine. The BLM kiosk has a theatrical presence to it. It’s a sign with nothing on it like a billboard from the theater of the absurd, but then I’m not sure what could be posted to prepare visitors for the moonscape ahead. I agree. You have to really want to be in Bisti, and you practice patience as you traverse a seeming void. 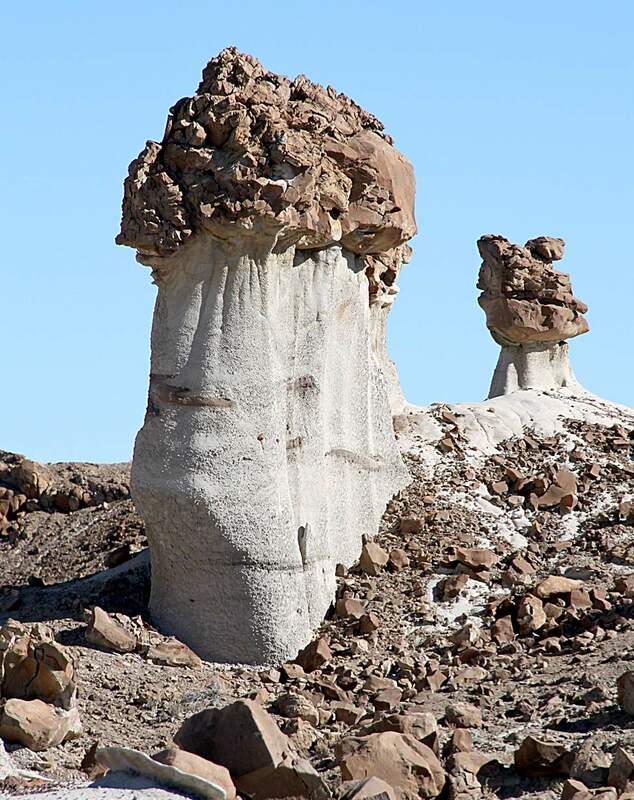 The father of environmentalism, John Muir, once said: “The clearest way into the universe is through a forest wilderness,” but then he never made it to Bisti. An hour after leaving the parking area, hikers find hoodoo heaven. It is a fairyland of whitish stone with mushroom caps. Follow a watercourse up rounded rocks and scramble to the top only to see grayish contours like sleeping elephants with tucked in trunks. Colors merge with rocks of reddish hues, and here and there strange stone splinters appear in small piles. Water has perennially shaped this dry, desolate landscape, which was once lush and verdant – for the stone splinters are petrified wood. Here in northern New Mexico ancient oceans sloshed across the landscape. Millennia ago not only did a forest cover what is now sterile soil, but the Bisti Badlands resounded with the terrible roar of the Bisti Beast. Do not expect to hear him now. He’s been gone since the late Cretaceous Period, or about 74 million years. Yet, he was discovered only in 1997, 13 years after Congress passed the San Juan Basin Wilderness Protection Act. 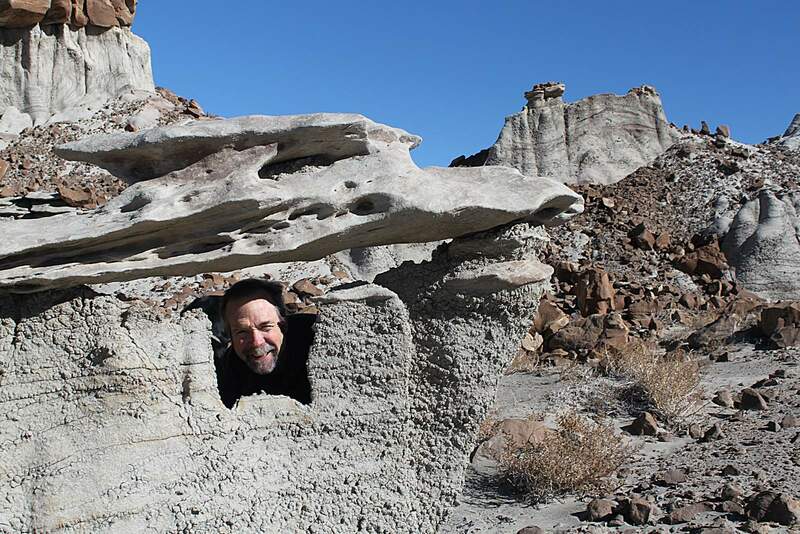 Thomas Williamson, curator of paleontology at the New Mexico Museum of Natural History and Science, led teams into the Bisti Badlands looking for fossils. Volunteer researcher Paul Sealey identified a potential site. Sealey already had found an ancient alligator, named Brachychampsea sealeyi by Williamson, but then he noticed something else. Sealey had located “a very rare and important fossil, the partial skeleton of a tyrannosaur, a member of the group of meat-eating dinosaurs that includes tyrannosaurus rex,” explains the museum’s website. Imagine! T-rex stomping around south of Farmington. Sealey had discovered the Bisti Beast, and not just any old T-rex. A new one, slightly smaller than his voracious cousin, but a terrible lizard nonetheless, with sharp pointy teeth, beady eyes, a 3-foot long skull and a length of 25 to 30 feet. Never before had a dinosaur skull been retrieved from a federal wilderness area, which prohibits motorized access. Volunteers had to carry in supplies on foot, endure blistering heat, fight nasty gnats and chip out large blocks of rock containing dinosaur bones to be placed in plaster packages and hauled out by a New Mexico Army National Guard helicopter. The volunteers succeeded. After trips to other museums to compare T-rex specimens, Williamson named Bistachieversor sealeyi as a new genus and species of tyrannosaurs. This was the first paleontological excavation allowed in a federal wilderness area. Bisti has no trails, but what a setting to time travel and step back millions of years. The area sees about 20,000 annual visitors or user days including many German tourists. 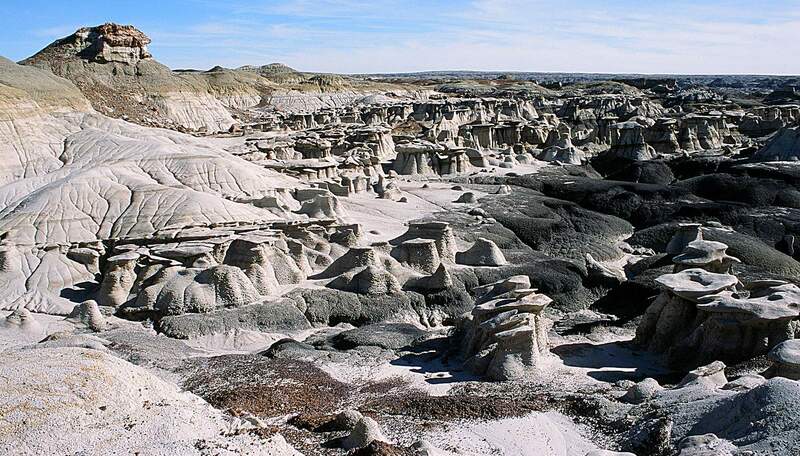 If the Bisti has hoodoos and rocks in random shapes, the east side of the wilderness or the De-Na-Zin has its own charms including 40- to 80-foot long intact gray and brown petrified logs flecked with quartz. That side of the wilderness is best accessed off U.S. Highway 550 near the turn to Chaco Canyon. Alleman says that hikers on the east side cross a sagebrush flat into small canyons and arroyos with some private property inholdings owned by Navajo families. I’ll keep returning to the Bisti, but conditions have to be just right. Not warm enough for gnats, not overcast so it’s hard to find the way out, not wet enough to sink in the loose soils and leave boot prints or maybe even boots. On a clear, dry early spring day hiking the Bisti is a trip to Mars without boarding a spaceship. Try it. And soak in the silence. Andrew Gulliford is a professor of history and environmental studies at Fort Lewis College. gulliford_a@fortlewis.edu.